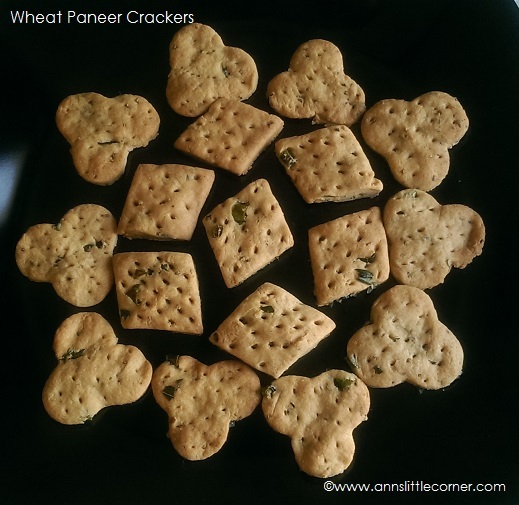 The Wheat Paneer Crackers are a salty and crunchy snack. Shred the Paneer. Chop the green chillies and curry leaves into smaller pieces. 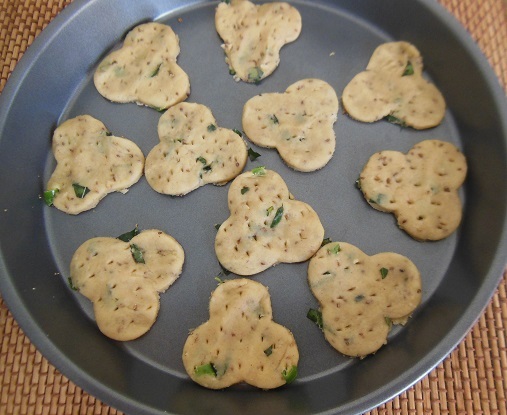 Mix Wheat Flour, Paneer, Green Chillis, Curry Leaves, Ajwain seeds, salt to taste and butter together and knead them. Set this mixture aside for 30 minutes. Make small balls from the kneaded dough. Flatten the balls with rolling pin and make into desired shapes. make smaller holes on the top using a fork. Grease the baking tray with butter and arrange the shaped crackers on it. Bake them for 15 minutes in 180 degrees or until the sides start darkening the cracker biscuits are ready. you can stop baking at this point. The crackers are now ready. 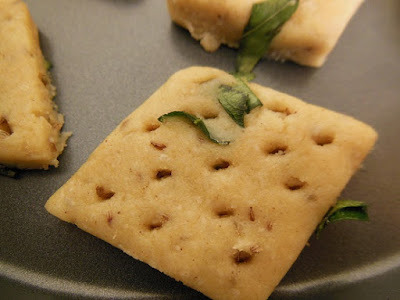 wheat Paneer Crackers is an easy snack. 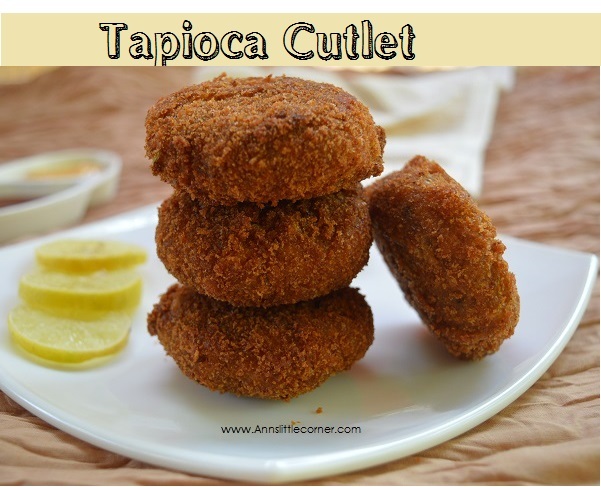 Can be served as a tea time snack. It can be used as a base for any delightful dessert. Chop the onion and Curry Leaves into very small pieces or they fall out while shaping them. 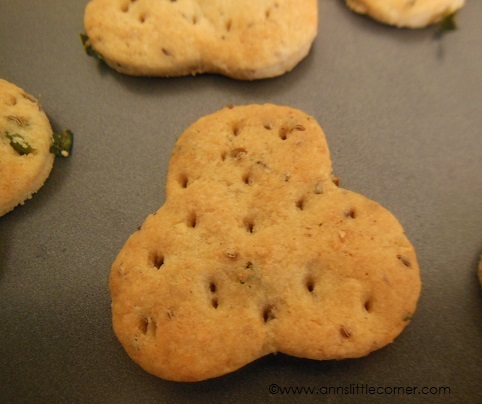 Making holes in the crackers is to stop them from raising. Make sure the cracker dough is not thick after flatterning and shaping it or it might not be crispy after baking. The baking time of the microwaves differ so read your usermanual carefully before you start baking. 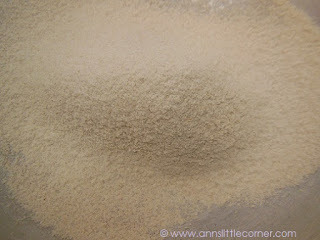 Take wheat flour and baking powder mix them together. Sieve the mixture so that they mix well together. 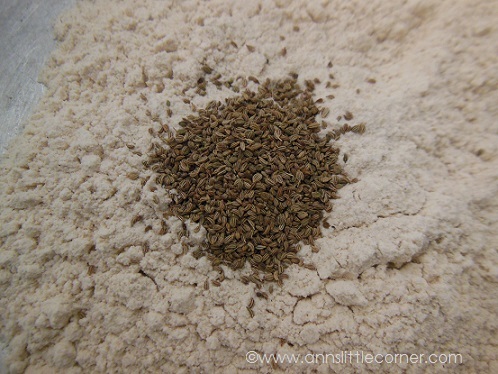 Add the ajwain seeds and salt to taste and mix them well. 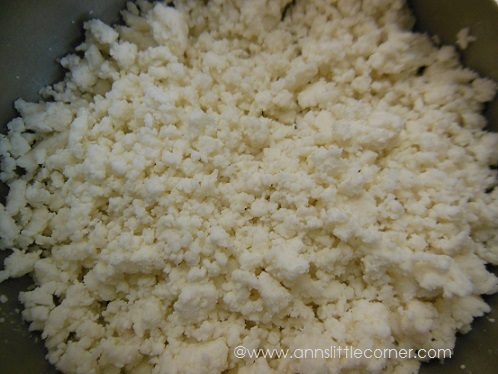 Shred Paneer and set them aside. 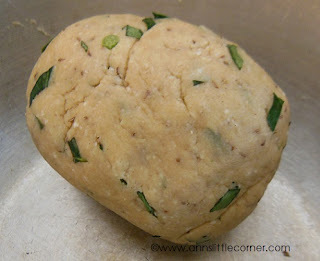 Add Paneer, Green Chillis, curry Leaves, Butter and mix them all together and knead the dough. Set this mixture aside for 30 minutes. Make smaller balls from the dough and flatten them using a rolling pin and cut them into desired shapes using cookie cutters. 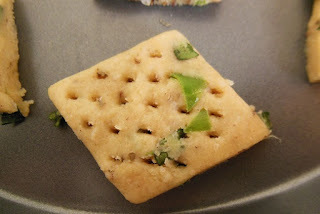 Make holes on top of the crackers using fork. Grease the baking tray with butter. Arrange the crackers on the tray. Preheat the microwave to 180 degrees. 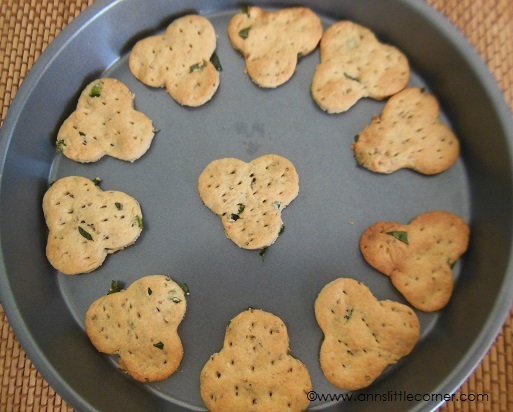 Place the crackers tray in the microwave and bake for 15 minutes or until the sides of the crackers starts darkening. When the sides of these crackers starts darkening the crackers are done. 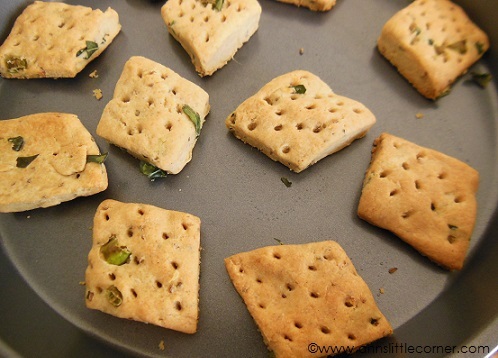 A batch of Wheat Paneer Crackers are ready to delight you.